Best location for Chama Gaucha menu prices. 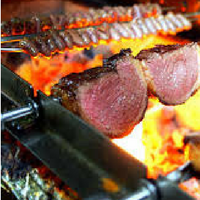 Chama Gaucha is a Brazilian style steakhouse offering guests all-you-can-eat cuts of meat carved tableside. The 12 cuts of meat can be paired with wine chosen from an extensive wine list. Before savoring the 100% USDA Prime meat, guests can whet their appetite at a garden fresh salad bar that offers over 30 freshly prepared items. All the meats are perfectly aged for 45 days then seasoned and grilled over an open-flame to lock in the flavors. Cooked meats are presented to guests on a large skewer. Selected meat choices are carved tableside by a trained gaucho. Meats will be presented to guests until guest indicates otherwise. Select wines from around the globe are available to be paired with the different cuts of meat. The first Chama Gaucha Steakhouse was launched in the Fall of 2011 by a skilled veteran of the Brazilian steakhouse concept, Joao O. Carlos. Hard work coupled with a dedication to serving quality food has led to the expansion of the restaurant chain. Today, there are 4 Chama Gaucha locations; San Antonio, Houston, Chicago, Atlanta. With reasonable price, an endless skewers of meat, and several other food options like salad, sides, and an impeccable variety of wines, Chama Gaucha is truly a place where food and passion intertwine to make the perfect place for meat and food lovers alike. For more information about Chama Gaucha, visit their official website. Does Chama Gaucha Steakhouse take reservations? Chama Gaucha does accept reservations especially for special events, holidays, or large groups. Is Chama Gaucha Steakhouse open for Lunch? Yes, Chama Gaucha is open for Lunch, Monday – Friday 11:30 am – 2:00 pm.